DATEL's QB family offers up to 150 watts of output power in an industry standard quarter-brick package/pin-out. This series features: ultra-wide input voltage ranges of 9 to 36 or 18 to 75VDC, high efficiency and isolation of 2250VDC in an encapsulated package with integrated baseplate, while providing a precise regulated output voltage. 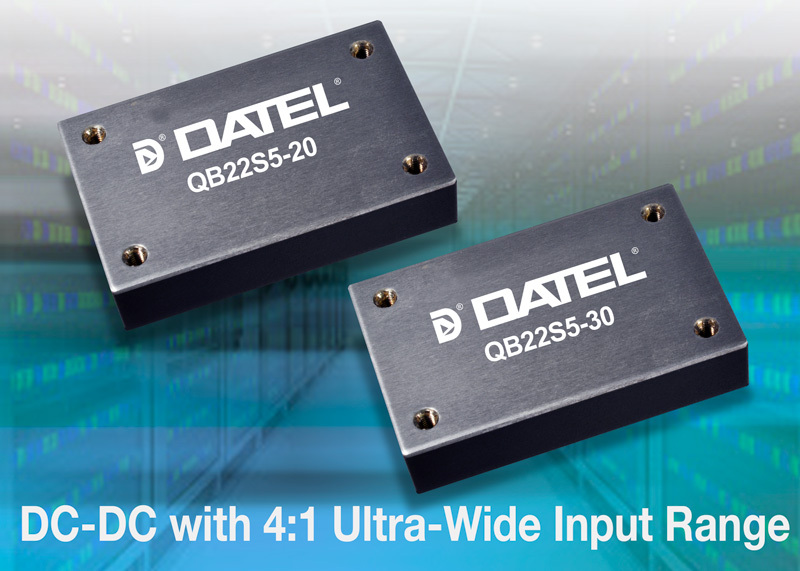 DATEL Inc. has announced the introduction of a new Quarter Brick (QB) Series that can deliver up to 150 watts of power. This new line of high power density DC-DC converters from DATEL is the preferred choice for military, industrial, distributed power architectures, telecommunications, and mobile applications. Offering a wide 9-36V or 18-75V input range, this QB Series delivers efficiencies up to 92%. The standard output voltages are 5, 12, 24, 28 and 48 volts that can be trimmed to a required voltage. These converters offer Input Under-Voltage Lock-Out (UVLO), and are fully protected against output overvoltage and over temperature conditions. All models have internal over current and continuous short circuit protection. The QB Series is offered in the standard Quarter-Brick footprint and operates over the extended temperature of -40°C to +105°C. It features a positive or negative On/Off control function and 2250VDC of isolation. In addition, DATEL can supply the proper heat sinks for these converters. Please contact DATEL if your application requires customized input/output voltages, alternate heat-sink types, alternate packaging, UL/CSA60950 or CE Mark 2004/108/EC. Other options available from DATEL include: models optimized for lower cost, higher power models using (2:1) input ranges, lower power/cost (75W and 100W family is available in 4:1 Vin), 60W to 100W versions for Railway Applications with 43 to 160VDC inputs or 66 to 160VDC inputs.